I no longer consider myself a full-fledged nerd /or a full on geek. At a certain point life just kind of takes over and those things that dominated our perception of ourselves lose some of their traction, as our very own Craig so aptly explained previously. Right now, I tend to refer to myself as a Reformed Geek. Life has staged an intervention for me and forced me into its own 12 step program that has curtailed my dogged determination to be fully immersed in nerdology. All of that does not mean that I no longer have any Geek tendencies, though. My former massive nerdishness still resonates strongly with my more nostalgic side and I keep my gauntleted hand in the water just to stay connected to that past part of me. That is why I thought it might be interesting to put together the following list of the current Top Five Nerdiest things in my life. 1) My Action Comics #1 T-Shirt – which I bought at a Target in Springhill, Florida. 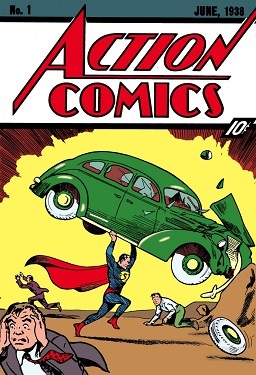 It features the cover of the original Action Comics #1 on the front. I wear it way more than I should ever admit, generally with jeans and an old sport coat that I bought in a department store in Princeton, New Jersey back when I lived there and ran a satellite VAR sales office out of my then employer’s Parent company’s NJ offices. I especially like wearing it to client meetings (because I am an agency guy now and it is the law) and when I do Stand-Up Comedy locally (again, because it is the law). It is much cooler than my friend Brad’s Avengers T-Shirt that he bought at a Walmart in Centerville, Utah. 2) Comic Book Saturday – this owes more to nostalgia than anything else on this list. Several years ago my (previously mentioned) friend, Brad and I found ourselves back in Utah simultaneously. We have been friends since High School, and at the time had a small business (actually, more like a club) that we called Modern Magic Ink. Part of that business (club) was that we rented a small office space (which acted more as a club house, than a working office) in the old business section of Clearfield, Utah and stored our comics there. We also kept our best vinyl there, and Brad and Karl set-up their drawing boards to do “work”, while Scott and I pretended to write comics and comedy sketches (while not so secretly dreaming of finishing High School and running off to NYC to become writers on SNL). Anyway, Brad and I found ourselves back in Utah in close proximity again after many years and found it difficult to connect on a regular basis due to the combination of his work schedule and family responsibilities and my complete lack of non-work related responsibility. The only time that worked for us to hang out was on occasional Saturday afternoons. Shortly thereafter Comic Book Saturday, or CBS as we like to refer to it now, was born. It is pretty much exactly what you might envision and hasn’t changed much since we were teens. Brad swings by my place, we drive to the Comic Book Shop (Night Flight Comics at Library Square in downtown SLC, Utah) and then we grab lunch some place and read each others’ purchases for the day. Brad is much more careful with his haul than I am with mine. My place is littered with comics that I have neglected to put back in their plastic protective coverings, while his are kept safely in labeled boxes in an upright position. So again, not much has changed since we were in High School sitting on the floor of Modern Magic Ink listening to Pink Floyd and Genesis and Rick Springfield (blame Brad) and Sheena Easton (that is my fault). 3) The Large Hadron Collider Jokes Page on Facebook – about a year and a half ago I started producing a weekly Stand-up Comedy Showcase and Open Mic (Comedy Roadkill) at the Complex (a local multi-stage entertainment venue just off of downtown SLC) and for the first six months while we were trying to get it off of the ground I acted as the defacto host – so, basically, every week I had to fill about 30 minutes of time with something that could be loosely described as Comedy. I always tried really hard to keep my time on stage as relatively fresh as possible and not just do the same jokes and bits over and over again. This met with less than overwhelming success. But it did lead to a bit that kind of caught on amongst some of the other comics. I would explain that I was on a quest to write the perfect joke about the Large Hadron Collider that didn’t resort to vulgar, easy, cheap sexual innuendo and then I would unveil a new joke that would be a spectacular failure at reaching that goal. I, of course, quickly grew tired of the kind of serial nature of the bit, especially since most of the Stand-up Comics and audience frequenting the show at that time had no idea what the LHC was, so I moved the whole premise to a Facebook Fan page and recruited some friends to help admin it. A couple of times a month we all write new LHC jokes and post them there. Right now, without any marketing or planned fan recruitment we have about 100 “Likes” on the page. Mostly, it would seem based on a quick non-rigorous check of profiles, by European-based Rocket Scientists. 4) N.A.G.A. (or more correctly: Nerds And Geeks Anonymous) – this is pretty much the highlight of my Facebook experience. It started mainly because the Social Web is endlessly interesting to me. Don’t get me wrong, I’m not an online Guru or anything like that, but we do have a pretty sizeable amount of our agency work involved in web and software design and strategy, so I try to be as up to date and smart on new things as I possibly can. This involves a lot of reading and a lot of playing around with new functionality and new services. When Facebook revised their Group functionality to make it more accessible to the primary user’s newsfeed I figured I should dig in and get conversational about it. I moved my Flash Fiction group over from the old Group Format first, then I created a new communication group for the local Stand-up Comics that I work with on Comedy Roadkill (see #3 above), and finally I created a secret group with no real goals to which I added all of my most favorite and engaging friends on Facebook, and then since it was a secret group I named it Nerds and Geeks Anonymous on a whim. Right now the group has about 91 members with about 35% of them being active participants, and of that 35%, approximately 70% of them are female. Which, you know… Win!! The group is mostly a haven for shared links of a nerdy nature and ongoing geeky repartee. And it is my most favorite thing about Facebook. 5) SLC Nerd – our elevator pitch for this is basically: “All of the fun of a Comic Book Convention, with none of the expense, travel or boring talk-y bits”. SLC Nerd is the culmination of my entire nerdish and reformed geekist existence. It was inspired by all of the things I have listed so far (especially N.A.G.A.) and the dream of getting my co-workers old band that I never got to see perform live back together for one show. It includes my ongoing affection for Comic Books, my envy of those that dive head first into CosPlay, and my nostalgia for Table Top Role Playing Games like D&D. Shameless Self Promotion Alert – It is going to be one big day of nerdy fun featuring the music of Rotten Musicians, Baby Ghosts, Rev Mayhem and Funktoast (Craig and Larry’s original awesome band from the 90s). Local Improv Impresario Bob Bedore is going to put together a Utah All-Star Improv troupe and they are going to present a completely original improv Sci-Fi musical. The Utah Rocket Club is going to be there with a display of some of their most coolest high powered model rockets. We are going to have CosPlay contests, an afternoon of Open Table-Top Gaming, and Night Flight Comics (one of our Primary Sponsors, along with mediaRif, and The Complex), are putting together some awesome gifts and prizes as well as organizing a Silent Auction to benefit the Comic Book Legal Defense Fund. The Hello, Sweetie! Podcast will be there following the action live, while the local Real Life Superhero Team the Black Monday Society will be posing for photos with the audience. We have also reached out to local LARP communities and the localSCA Kingdom to invite them to join us. And we are going to have local comedian/singer Jon Clark as our most awesome of hosts. The whole thing is being produced by Gangrene Productions, which is the “viral” arm of mediaRif (the digital creative agency to which Blogmaster 2000 belongs) and focuses on humorous and original video, animation, music and live events production & promotion. Gangrene is also the home of our annual Agency Creative event, the Gangrene Comedy Film Festival. The show is Saturday, March 24th in the Grand at the Complex. It is an all ages show. Admission is only $10. Doors open at 2pm for Table Top Gaming, CosPlay judging starts at 4pm, and the entertainment kicks in at 6pm. Come out and join us for the Nerd Celebration of the Year. I reserve the right to adjust this list as circumstances dictate. But probably won’t – I have too many comics to read, and YouTube fan vids to share, and Hobbit production stills to obsess over.